I arrived the first afternoon in southeastern Idaho to chase sharp-tailed grouse and gray partridge after an 11 hour white-knuckled drive…I left Colorado at O’dark-30 so that Andy and I could get in a half day’s hunt before heading to our folks home. We were told of a place where our brother Scott and his hunting compadres had been recently chasing muley bucks. We found this bird haven and loosed our bird dogs in anticipation of coveys of huns and Columbia sharp-tailed grouse. As the light faded and long shadows were cast on the winter wheat, we had seen (and missed) numerous grouse and 4 to 5 nice coveys of huns. One highlight was Gary’s dog Pepper pointing a 15 to 20 bird covey of huns and me actually making a rare double on the covey rise. 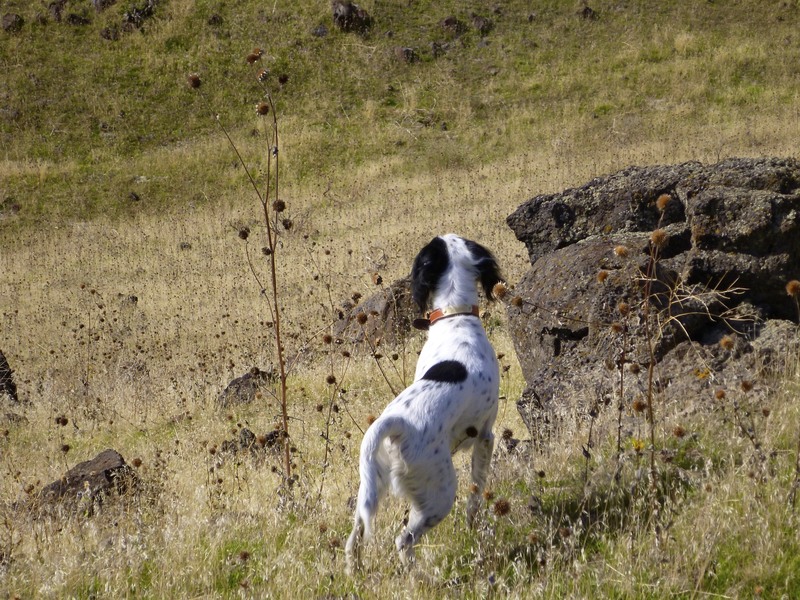 One low light was that my setter Gretchen had developed Limber Tail Syndrome in the very first afternoon of chasing birds in the Idaho uplands. Limber Tail Syndrome is a condition commonly referred to as limber tail, cold water tail, or flaccid tail syndrome and is familiar to owners/trainers with bird dogs, primarily English pointers, English setters, Gordon setters, and Labrador retrievers. The typical case consists of a bird dog that suddenly develops a flaccid tail immediately after vigorous exercise. The tail either hangs down from the tail base or is held out horizontally for several inches ( 3 to 4) from the tail base and then hangs straight down or at some degree below horizontal. 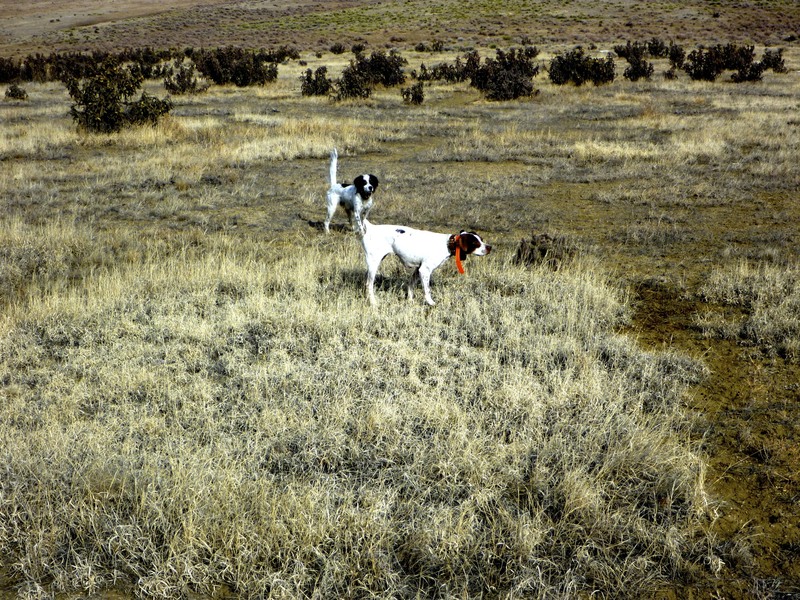 Most bird dogs recover spontaneously within a few days to a couple of weeks. 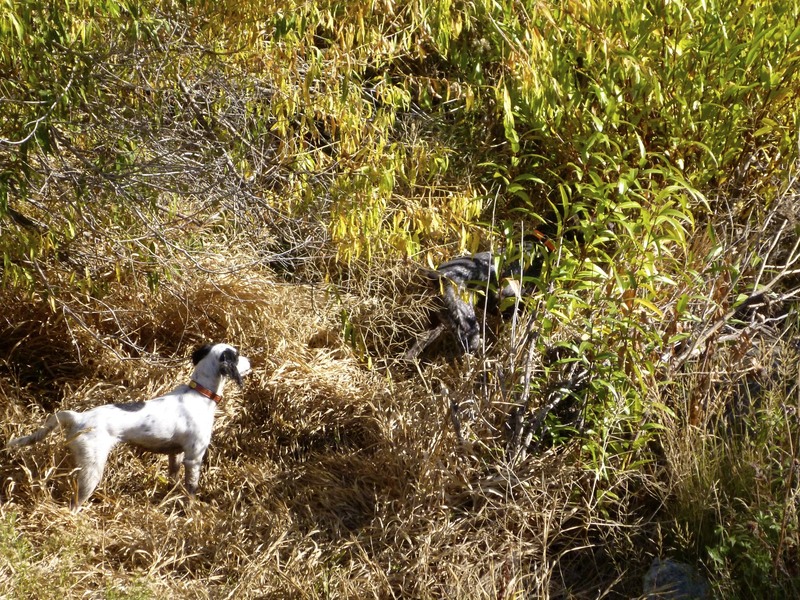 Less than one third of affected bird dogs experience a recurrence at some point in their field career. Affected bird dogs almost always have a history of long crate transport, vigorous roading or exercise the previous day, or exposure to swimming in cold water or cold/wet weather. There is some evidence in the literature that suggests that affected bird dogs have elevation in their muscle enzymes at the immediate onset of the condition and they therefore have muscle damage (although reversible) to the coccygeal muscles. As I mentioned before, most bird dogs recover spontaneously with rest and NSAID’s (anti-inflammatory meds such as Rimadyl or Meloxicam) therapy. Gretchen has not yet completely recovered in 10 days, but I’m hopeful! Next up: Colorado scaled quail on the prairies!